Destiny 2: Forsaken's first Annual Pass content Black Armoury is set to launch later today for all platforms, and will include a number of powerful new weapons for players to get their hands on - including the return of one fan favourite. This first part of the Annual Pass content adds the brand new vendor "Ada-1" to the game, who has a variety of new legendary weapons in stock for players to get their hands on. Black Armory will also feature story content that tells the tale of the creators of the Forges, three families whose history had been lost until now. There's also matchmaking activities to try out and more! 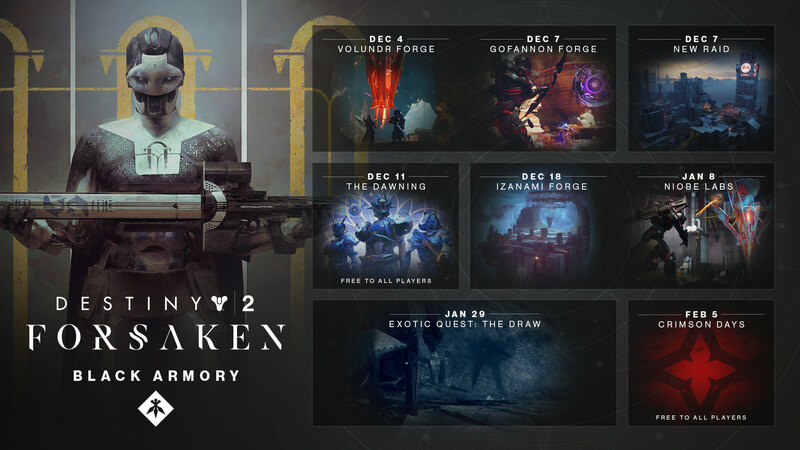 The Black Armory will be available to until March 2019. GROW YOUR ARSENAL - Powerful, unseen weapons await – including the return of Heavy Machine Guns. Each one tells a story, but you’ll need to earn the right to wield it. REIGNITE THE LOST FORGES - An all-new three-player matchmade activity unfolds over the Season. Survive the chaos at each Forge to craft the Black Armory’s Golden Age weapons. UNCOVER THE PAST - There’s more to the Black Armory than weapons. Ada-1 will introduce you to the creators of the Forges, three families whose history had been lost until now. RAID THE LAST CITY - Drop into a previously off-limits area in Scourge of the Past – a new Raid experience unlike anything you and your Fireteam have faced to date. An Exotic Quest named "The Draw" will also become available to all Annual Pass members on January 29th, and looks to bring back "The Last Word" hand cannon, that was popular in the original Destiny game. Purchase the Destiny 2: Forsaken - Complete Collection for 10% off, and get access to all upcoming Annual Pass content.